Football fans get a little weird around the end of August. Lots of hand-rubbing, listening to interviews on the web and mock-tackling your wife as you pass each other in the living room. Someone drops a book, or their smartphone and you dive on it, yelling "FUMBLE!!" - Or wait, is that just me? This is 2015 Spartan Football! Circle the home opener against Oregon and annual battles with OSU and michigan. I absolutely love football. Most of all Michigan State Spartan Football and right now is a special time because practice has begun, but we&apos;ve not yet had our first game. Everything is in front of us. All of our goals within reach. Starting with our first game versus Western Michigan on September 4th and ending with our last regular season game versus Penn State, the Spartans will be bringing energy, focus and Spartan power into every game. Football season is such a cool time on MSU Campus, making it the perfect time for a visit. Weather is warm, the leaves are beginning to change, the sounds of the band fill the air - its the perfect Big Ten football environment. Dozens of area hotels will serve as your home away from home and area museums, shopping and theaters serve as entertainment before and after the game. Did I mention its almost football season?? I can smell the tailgate grills now... Take a look at the schedule and pick your weekend for a visit to East Lansing for some incredible Spartan Football! Are you a big fan? Do you bleed green, like me? Then take note of the MSU away games too! Some big rivalry match-ups are on the road this year. Maybe take an opportunity to explore some more of the Midwest? Or at least, a bare minimum, head to East Lansing and catch the Spartans even when they&apos;re away at one of the great Spartan bars and restaurants in the area. The environment feels like you&apos;re at the stadium and before you know it, you&apos;ll be high-fiving strangers and singing the MSU Fight Song arm-in-arm with people you just met. From mid-August to around New Year&apos;s we get football of all kinds to enjoy. Spartan football promises to be another solid season under Coach Mark Dantonio. A preseason #6 national ranking has the Spartans among the best in the country, and you know they&apos;ll be making an excellent case to be Big Ten Champs as well. 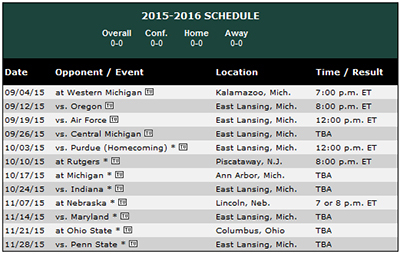 Start making plans to get to East Lansing for Spartan Football! Go Green and Go White!